If the smartwatch game has yet to impress you, then I recommend that you take a look at one of the hottest Kickstarter products we have seen in a long time called Pebble. We have been personally following Pebble for the last week or so, watching it go from having a goal of $100K, eclipsing that in a few days, and then completely blowing the hell up thanks to some press coverage and viral internet buzz. In less than a day last week, it topped $1 million from backers, then hit $2 million, and finally, over the weekend cracked the $3 million mark. Again, this project started out with a $100K goal and is now well over $3 million. 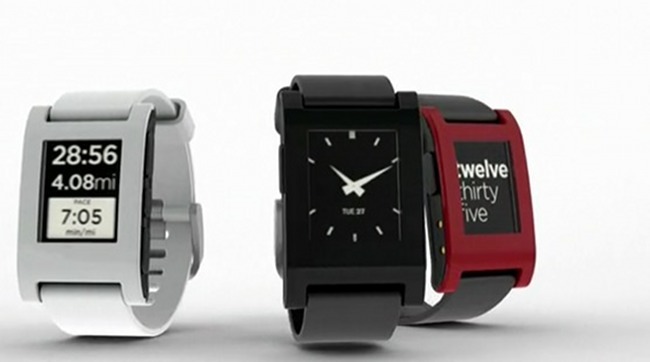 So what is the Pebble E-paper smartwatch? It sells itself a bit like the Sony Smartwatch that was released last week, but it uses an e-paper display rather than an OLED. It should last for 7+ days on a single charge, has multiple clock faces to choose from that always show, pairs with your device via Blutooth, already has a variety of apps in the works, and has an Android app to connect to your phone through. The device will show you incoming calls, email notifications (including Gmail), weather and calendar alerts, Facebook and Twitter info, and even vibrate when many of these things happen. There is also a golf GPS tracking app in the works. Oh, and since the project hit the couple of millions mark, its makers have decided to fully waterproof the device. For those of you that swim and want to track your workout, this would be the smartwatch for you. It should fit most 22mm watch bands. So as you can see, it already does more than the $249 MotoActv, yet you can back the Kickstarter for $115 and receive one. If you are interested, there are 32 days left in the project to get in early. This might be the first smartwatch worth checking out. Motorola Switching to Snapdragon S4 Processors For Next Lineup of Phones, Including the RAZR HD?